Harare Sports Club is a cricket ground in Harare, Zimbabwe. Harare Sports Club has served as the primary cricket venue in Rhodesia and Zimbabwe since its inception. 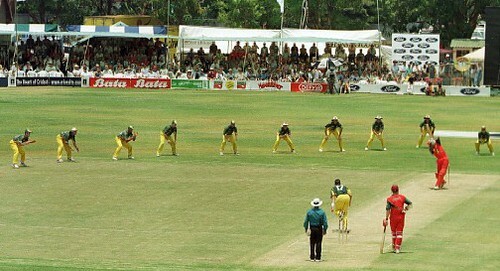 The ground became a Test venue in October 1992 when Zimbabwe played their inaugural Test, against India. Soon after, the ground played host to its first One Day International. In 1994, Harare Sports Club was the site of Zimbabwe's first ever Test win. 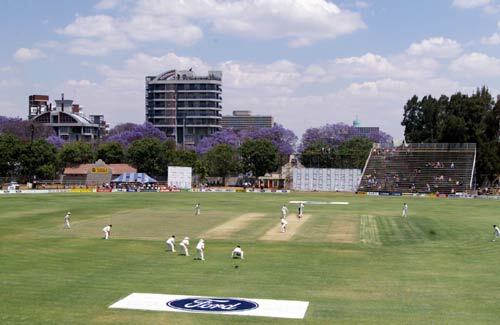 Surrounded by jacaranda trees and with a beautiful gabled pavilion, Harare Sports Club is in the heart of the city. HSC hosted Zimbabwe's first Test in October 1992 and has been the country's major Test and one-day venue since. Although the club itself does not possess any of the major stands associated with major sports grounds, the capacity of around 10,000 can be increased by the use of temporary stands. However, that capacity is rarely tested and even games against major touring sides fail to draw any other than moderate crowds. The main social centre is the pavilion with its popular bar, and the other end of the ground is home to Castle Corner, the alternative and usually lively bar. HSC is also home to the Zimbabwe Cricket Union, the country's cricket board. The ground has a capacity of 10,000. In October 2010 Zimbabwe Cricket announced that the planned renovations to the Harare Sports Club and the Mutare Sports Club to be prepared in time for the fledgling Domestic Twenty-20 tournament in November. The work will include an increase in the availability of seats, spectator facilities, training facilities and also Ground facilities floodlights also might be installed for day/night matches. The revamps are being done also to help Zimbabwe to return to Test cricket. Images of Harare Sports Club, Zimbabwe.